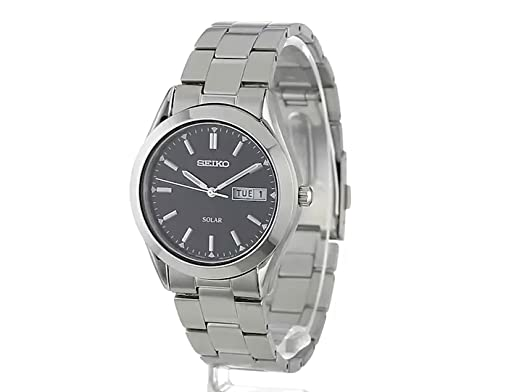 A classic design is combined with the best in modern technology in this Seiko watch, whose solar capabilities keep accurate time without need of a battery. Solar. No battery change required and powered by all types of light. Solar cell with high performance electricity generation. Energy-efficient movement with long power reserve. This dress watch has a brushed and polished stainless steel case and bracelet which creates an elegant finish. The timepiece is constructed with a durable crystal that protects the black dial. LumiBrite hands and English/Spanish day/date calendar. 30 meters water resistant. If I can be of any further help please write me your comments below or use the contact form from the support page.